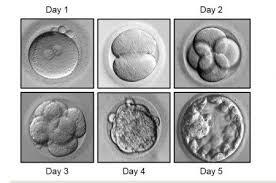 If you have only a single embryo, should you do a transfer on Day 3 or Day 5 ? This is a common dilemma which both patients and doctors face , and there are pros and cons for both approaches. After all, if you have only one embryo, then why bother to wait until day five? Why not put it back on day three , and hope that it implants? Isn't a bird in the hand worth two in the bush ? After all, if it's going to implant, then isn't the uterus as good as the IVF lab ? Yes, this makes intuitive sense, and lots of IVF clinics push for a Day 3 transfer, because they can proudly tell the patient that at least we managed to do an embryo transfer for you. If it didn't implant, that's your bad luck ! The problem with this approach is that because these patients are poor ovarian responders, the chances of their embryos being genetically abnormal (even though they look fine on Day 3), is actually very high. This is because the chances of their eggs ( and therefore their embryos having genetic problems is high). This means the odds are that these embryos most likely won't implant. Now, if they don't implant , patients will have lost valuable diagnostic and prognostic information, which they could have got if they'd continued growing them to Day 5. If the IVF cycle fails after a Day 3 transfer, they are never sure show what the reason for the failure was. However, if they try growing the Day 3 embryo to Day 5, and if it arrests in vitro, then at least they have documented the fact that the problem is with the embryo ( because of the poor egg quality) , which means it's easier for them to make a decision to use donor eggs for the next cycle, rather than continue trying to use their own eggs pointlessly. This is why our advice is to do Day 5 transfers only ! However, this is an option only is you are taking treatment at a high quality IVF clinic , which has a great IVF lab , and which provides photos of embryos routinely to all their patients. Is LH the villain in IVF protocols ? When IVF is bad for you! Why bed rest is bad for IVF patients. Making sense of your IVF medications! A free solution for reducing IVF stress! When IVF is bad for you ! Bed rest is bad for IVF patients. The infertility doctor merry-go-round !